Arsenal have to quickly move on from their recent defeat to Everton in the league as Napoli come calling the first leg of the 2018/19 Europa League quarter-final. Unai Emery in his first season in English football will love to get his hands on a silverware and he is some kind of expert when it comes to Europa League. But Napoli guided by the great Italian manager Carlo Ancelotti will fancy themselves to go through as well. The Gunners have had to come behind in the last two rounds but they play at home tonight in the first leg which is bound to affect their game. Granit Xhaka and Laurent Koscielny who have not yet played for Arsenal since the international break could feature against Napoli. Sokratis also comes back after serving his suspension to boost their defence. Aaron Ramsey and Pierre-Emerick Aubameyang came off the bench against Toffees but could find themselves in the starting eleven tonight. If Ramsey features it will surely be at the expense of Mesut Ozil who was looking to make his way back in Unai Emery’s scheme of things after some decent performances in the past few weeks. UEFA Champions League 2018–19 Leg 1 Results: Barcelona Register Win Over Manchester United While Ajax Draws With Juventus. Kalidou Koulibaly who has been linked with a host of English clubs including Arsenal is back after serving his suspension. He is one of the best defenders in Europe currently and surely his presence will have a positive effect for Napoli. The forward line of Lorenzo Insigne and Dries Mertens have goals in them and can trouble the hosts with their pace and movement. Fabian Ruiz and Allan will provide the defensive shield in the middle for the Italian outfit. This could be another massive European night for the Gunners fans and there is bound to be goals when two attacking teams collide. Arsenal vs Napoli, UEFA Europa League 2018-19 Football Match Schedule (Date, Time and Venue Details)? 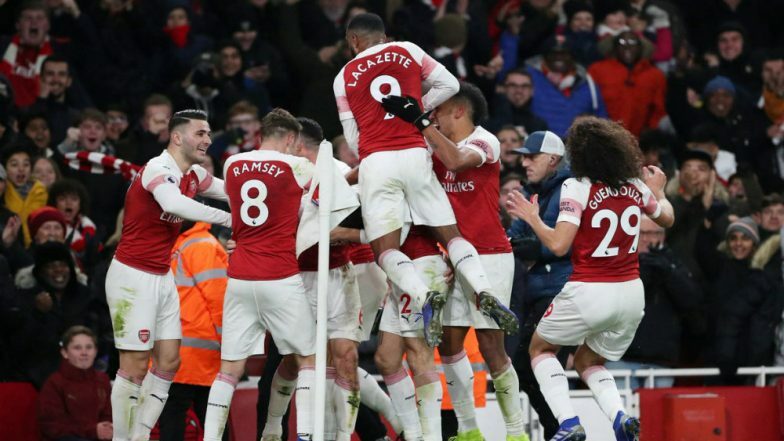 It is going to be another late night match for football fans in India as Arsenal face Napoli on April 11, 2019, at 12:30 a.m IST (Thursday midnight). Arsenal vs Napoli football match will be held at the Emirates Stadium. How to Watch Live Telecast of Arsenal vs Napoli, UEFA Europa League 2018-19 Football Match? The quarterfinal contest between Arsenal and Napoli makes an exciting contest in UEFA Europa League. The live telecast of Arsenal vs Napoli will be done on Sony Ten 2 and Sony Ten 2 HD channels. With Sony Sports Network as the official broadcaster, their digital platform Sony Liv will be providing the free video streaming. You can catch Arsenal vs Napoli, UEFA Europa League with free live streaming online on Sony Liv.